SoFi loans is one of the most popular online loan sites around for a reason, low rates and some unique features you won’t find elsewhere. Of course, that’s if you qualify. SoFi (formerly Social Finance) isn’t just an online loan site for personal loans but also offers student loans, mortgages and parent loans. Besides low rates, the unemployment protection program can even pause your loan payments while SoFi career advisors help you get another job. SoFi is currently running a limited time promotion for its personal loan program. Borrowers and referrers both get $100 on funded loans. Click on one of the links below for a personal loan and you’ll get $100 with your first loan. 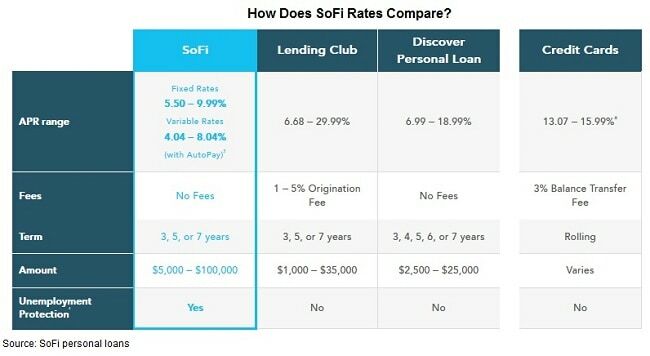 How Does SoFi Loans Rates Compare? Nearly 150,000 people have taken out more than $10 billion in SoFi loans since 2012, passing many of the older personal loan sites. Why has SoFi been so popular for personal loans and other unsecured loans? Because they offer some of the lowest rates online. Personal loans are available from $5,000 up to $100,000 and for three to seven years. Like other personal loans, SoFi doesn’t charge a prepayment penalty which means you can pay off your loan anytime without worrying about extra fees. This makes SoFi loans a great alternative to short-term business loans because you can take out a longer-term loan at a lower rate and then repay it early. SoFi loans for students start around 3.5% with discounts for auto-pay each month. Even at higher rates around 5% on personal loans, the company still comes out well under other personal loan providers. SoFi also offers variable rate loans, not usually an option on other loan sites. You can get a discount on your rate for a variable rate loan but the rate might increase as interest rates increase over the next few years. If you are planning on only borrowing for a few years, you can save money by getting a variable rate loan and paying it off before rates increase too much. SoFi offers a lot of other services you don’t get with personal loan providers including career support and wealth advisors. Since student loans is a big part of the business, SoFi has brought on advisors that can help people with advice from getting a job to negotiating a raise. If that were not enough, SoFi offers unemployment protection on its personal loans. Lose your job and SoFi may be able to pause your payments and help you get a new job through their career counseling. SoFi loans are some of the most difficult to qualify among online personal loans. That’s not an opinion but from talking to many borrowers that have tried but didn’t qualify for a SoFi personal loan. SoFi doesn’t release a minimum credit score borrowers need for a loan. I’ve talked to borrowers that were denied a SoFi loan but were able to get one from PersonalLoans which allows credit scores of 660 FICO or higher. That’s not to say that you can’t get a loan on SoFi if your credit score is a little lower or that you shouldn’t apply. Checking your rate is done by a ‘soft inquiry’ which means it doesn’t hurt your credit score to apply. 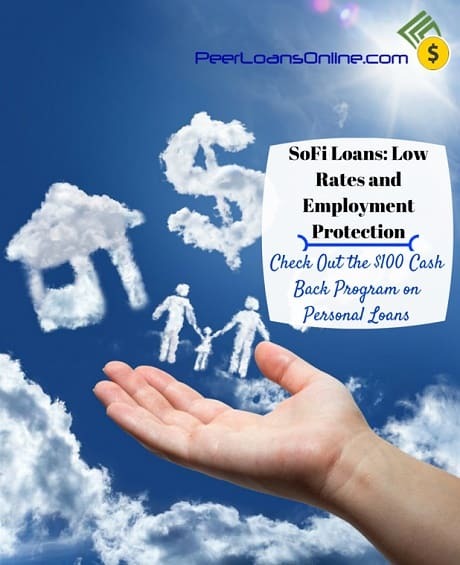 If you are not approved for a SoFi personal loan, check out this list of best peer loan sites for bad credit loans. The SoFi loan application process is quick and fairly simple. It’s designed to not waste your time if you don’t qualify for a loan. The only two requirements are that you be a U.S. citizen or permanent resident and at least 18 years old with a current job. You first fill out some basic information to check your rate. If you’re approved, you’ll be able to select a few loan options including fixed-rate or variable and how long you want to pay it off. SoFi is a little more demanding when it comes to document verification compared to other personal loan sites but it’s still a pretty easy process. Verification can be done with screen prints from your computer or by scanning and emailing your documents. SoFi complies with all federal regulations for loans and you’ll get a full sheet of loan terms before you accept your personal loan. You can electronically sign your forms and set up autopay for a discount on the rate. Another advantage of SoFi loans is that the company offers a much wider range of loans than other sites just focused on personal loans. Besides unsecured loans, SoFi offers student loans and mortgages as well as parent loans. While personal loans have come under pressure this year on problems at other online loan sites, the fact that SoFi can offer a wider range of loans could help it survive as other companies fold up shop. The online loan application process is a little different for other types of SoFi loans, especially for mortgage loans where you’ll need an appraisal. Since it’s not a bank, SoFi can do more with its mortgage loans including offering jumbo loans up to $3 million. The low-rate savings extend to all SoFi loan products with students refinancing their loans reporting an average of $292 a month in savings from their previous loan, that’s over $3,500 each year in savings. SoFi loans is one of the only online loan sites that can refinance both federal and private student loans. I’ve seen ten people get approved for a SoFi loan. That’s not as many as I’ve seen approved on other personal loan sites but the savings on SoFi loans are impressive. Just a 3% difference in rates can save you thousands on a personal loan over five years. It costs nothing to check your rate on an unsecured loan and the whole process takes less than 15 minutes.